An Advent wreath is customarily a circle of greens, sometimes with berries and blue or purple and pink ribbons, with four candles around the circumference. 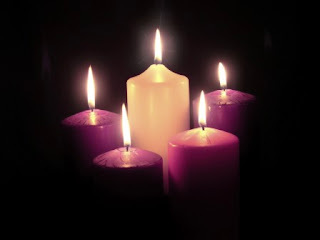 These may be all white, or three purple and one pink (for Rose Sunday, the third Sunday of Advent - which is traditionally dedicated to Mary – but now sometimes observed on Advent 4 when the Marian Gospel story is read in the Revised Common Lectionary). Each Sunday, a new candle is lit, with a prayer, until all are burning. A fourth white Christ-candle may be put in the center and lit on Christmas Eve. The Scripture lessons for the Sunday may be read as candles are lit by the gathered household. If your candles burn too low, it’s fine to replace them, and don’t let the greens dry out and become a fire hazard. You can use votive lights in glass, tapers, or columns in the wreath - if the candles are big enough, you might burn them during a Sunday family meal. There is another set of prayers for a wreath in the Book of Occasional Services available from Church Publishing Inc.
as the morning light after a wakeful night! through Jesus our Savior. Amen. as the water of life and refiner's fire! through Jesus our Deliverer. Amen. breaker of chains and renewer of life! Open our eyes to your presence in all the earth. and Jesus Christ risen and alive, through whom we pray. Amen. Come, O Holy One, as the beloved child, Emmanuel! Glory to you, Giver of all good gifts! in the child Jesus. Amen. Jennifer M. Phillips, an Episcopal priest, is Rector of St. Francis Church, Rio Rancho, NM, and a former member of APLM Council. She has published poetry in many poetry journals, and her articles on social justice, AIDS, sexuality, and liturgics have appeared in Christianity and Crisis, The Witness, Episcopal Life, The Living Church, and Anglican Theological Review. She is the author of the book Preaching Creation, and Prayers for Penitents from Cowley Publications, Simple Prayers for Complicated Lives, edited Ambassadors for God: Envisioning Reconciliation Rites for the 21st Century (Liturgical Studies Series,5) from CPI, and is a major contributor to collections of prayers and liturgies now in use in the Episcopal Church: Enriching Our Worship series, and Gleanings: Essays on Expansive Language with Prayers for Various Occasions, (Meyers, Petingell, eds) both from Church Publishing.